In recent years, Glenis Redmond has logged more than 360,000 miles on her car. She travels the country, meeting students and elders, teachers, and administrators. She shares and encourages. She cries and laughs and dances (a lot!). She inspires. And she is a poet. Whatever you hold in your mind as what a poet is, what she looks or acts like, be ready to rid yourself of the stereotype. Redmond is a working poet. A hustling poet. A road warrior poet. She makes her living—and her life—as a teaching artist with a social justice angle, most interested in the disenfranchised, that individual who has not had the opportunity to express his or her own voice. Redmond’s current bio reads like one found on the back of a lifetime achievement award: a Greenville native, she holds an MFA from Warren Wilson College; she is an esteemed Cave Canem Fellow and also a NC Literary Fellowship recipient from the NC Arts Council; she participated on the task force that created the first writer- in-residence at the Carl Sandburg Home National Historic Site; she’s written hundreds, if not thousands, of poems and has published in literary journals and anthologies across the country; her book Under the Sun has been bought and read widely; she is a Kennedy Center teaching artist and is listed in their National Touring Directory; she is the poet-in-residence at State Theatre, New Brunswick, New Jersey, and the poet-in-residence at the Peace Center for the Performing Arts, here in Greenville. Redmond got her break when a booking agent heard her perform poetry at a unity show in protest of a KKK rally in Asheville, North Carolina. Through this agent, Redmond got a glimpse of the future: that there was indeed a place in this world as a career poet. 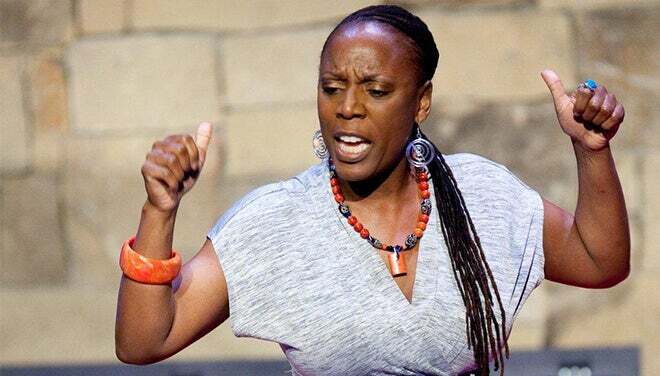 In addition to being a full-time poet, it’s Redmond’s work as a Kennedy Center teaching artist and poet-in- residence that puts miles on her car to share her voice and to enable the voices of others. She works with teachers who understand the value of poetry in the classroom. She often spends a week at a time in each locale, teaching students the power of the poetic word. More locally, through Peace Voices, the Peace Center’s newest outreach initiative, Redmond visits local middle and high schools, working with students and their teachers in brainstorming and writing activities. Most conclude in student-written poetry that explores both personal and public themes, such as the reactions to the tragedies of Ferguson or Trayvon Martin. Peace Voices Poets is a separate leg of the program, where students participate in an ongoing poetry workshop at Ramsaur Studio every other week for two to three hours per session. The center just “graduated” its first class last year. Peace Voices also offers public poetry readings, allowing locals to share their own words, as well as hear nationally-recognized poets. It’s her work through Peace Voices’ community poetry workshops, however, that epitomizes Redmond’s ideals of inclusivity and informs her goal to be a poetic bridge. These Saturday workshops held at Ramsaur Studio encompass the whole community: from the middle school and high school student to the Ph.D., from writer and artist to the 80-year- old elder, from the professional looking to enrich his living to the parent wanting an outlet for her voice. Truly, these workshops are designed for “people from all walks of life,” and the supportive atmosphere sets the tone for participants to safely and confidently share their words (and maybe even bare their souls). Poet Glenis Redmond: A road warrior? Absolutely. A poetic bridge? Unequivocally. And she is building that poetic bridge right alongside the Liberty Bridge through the thickest artery of Greenville. She is building a bridge in all those communities she visits up and down the East Coast. And, especially to the disenfranchised students who experience having their own voices heard for the first time, she is most certainly building a bridge to the future.